FORMER James Bond Roger Moore has sauntered down the Croisette, chased villains up the Eiffel Tower and floated in space inside one France's largest film studios. He has lived on the Riviera and now spends his time between Monaco and Switzerland, never far from France. The rich modulated voice that seduced so many Bond babes is still weaving its magic today, even at 82, as he told how he was first introduced to the country. "It was in 1954 and I was on location filming Diane, playing Henry II to Lana Turner’s Diane de Poitiers. Later I filmed Moonraker in Paris." First impressions? "Wonderful. Where else better to live and eat, so well? "Our family summer holiday home used to be Italy but being in the public eye with Bond and the spate of kidnappings at the time in Italy, we were worried about the children. Our house had already been burgled. "Songwriter and composer Leslie Bricusse suggested we should try his house in Saint Paul de Vence [in the Alpes-Maritimes]. We liked it so much we bought a house there but after several years and more burglaries, we moved to Monaco where security is high." What aspects of France do you like? "The motorways - the way they are kept - I love them. But I dislike the garage spacing, and space from one floor to the next - far too small." Sir Roger still pays frequent visits in the summer to the Colombe d’Or restaurant in Saint Paul de Vence, which is decorated with original works by artists such as Picasso and Matisse who also spent time there. His origins are far from the Colombe d’Or. 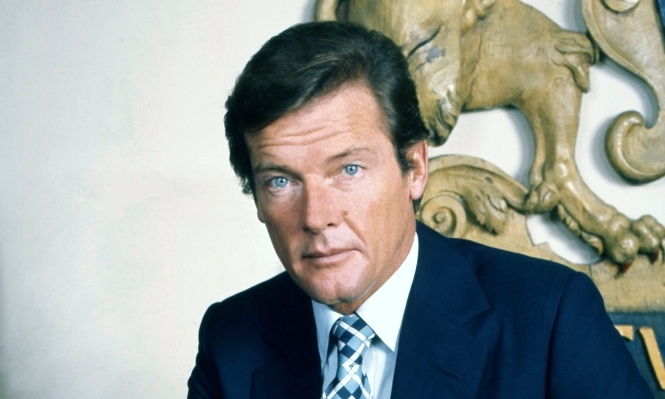 Roger Moore was born in Streatham, south London, an only child of a policeman. From the start the boy was blessed with a great body, good looks and a brain that took him to grammar school. After the war and time as an evacuee he returned to London to work in a cartoon studio in Soho earning £3.50 a week and spent his spare time swimming in the Marshall St Baths where that torso was honed. So much so he was offered work as a spear-carrying film extra in Denham studios. The director thought the lad had something and offered to pay his fees for the Royal Academy of Dramatic Art - where the elocution department took care of his 'sarth London' vowels. "They told me I had a sibilant ‘s’." But he admits to being baffled by current spoken English: "I can’t understand them - ghastly - Holby City, The Bill. My daughter was told at London Academy of Music and Dramatic Art she spoke too well. "I am very much a family man, close to my children; one lives near us in Switzerland. I have three grandchildren, soon to have another, and Kristina, (his current wife) has two." In August 2001, Moore was present at the wedding of his step-daughter Christina Knudsen, giving her away at the Eglise Saint Jacques in La Colle Sur Loup in the Alpes Maritimes. Guests included Michael Caine and his wife Shakira, Shirley Bassey and Michael Winner. He married his first wife whom he had met at RADA, when he was 19 while doing his National Service as a Captain in the Royal Army Service Corps in Germany. With tongue in cheek, he adds: "The only active service I saw was picking up a glass of champagne. "But I was lucky, had I been three or four years younger like Michael Caine, I would have been in the Korean War." Later he worked as a male model - sift through some old knitting patterns, you are quite likely to find him - and earned the nickname The Big Knit before going into Rep for a short time: "I remember the director yelling ‘For God’s sake, bloody well smile’, so I’ve tried to do that ever since." Separating from his wife he met Dorothy Squires - a feisty pretty woman, a famous singer, and 12 years his senior. They married in 1953, and she took him to Hollywood to promote her latest hit. With his obvious attributes he landed a small film part with some more modest offers to follow. Dorothy Squires came from a relatively impoverished family in Dafen just outside Llanelli in South Wales and I was curious to know what they thought. He chuckles: "I was a parasite, a ponce. I should get a proper job." With Dorothy working all over the world and young Roger playing small roles, the marriage failed, especially when he met his third wife, equally feisty Italian actress Luisa Mattioli. The divorce was acrimonious but when Dorothy later became seriously ill and bankrupt, he paid for cancer treatment and funded a plaque on the house where she was born. Did he choose very feisty women? "No, I just like women in general." He recalls a cruise with Luisa where he was given an award as the most henpecked husband on board. "But it was a private boat," he laughs. He and Luisa had three children but after 27 years, they divorced and in 2002 he married Kristina Tholstrup, a neighbour and his wife’s friend. It was The Saint series, a few episodes of which he directed, which put him on the public’s radar both in the UK and the US as Simon Templar and there followed The Persuaders! with Tony Curtis, which began life on the French Riviera. One memorable shoot on the Croisette in Cannes drew gales of laughter from the watching crowd when Mr Moore holding the lapels of a very bad tempered and foul mouthed Curtis, looked him straight in the eyes and said "And to think those lips once kissed Piper Laurie." Then came James Bond, which he took over from Sean Connery. For 12 years he was the light-hearted spy, making seven films, finishing at age 58, when he admitted feeling uncomfortable playing love scenes with women not much older than his granddaughter. I suggest he never seemed to take things wholly seriously - perhaps the reason why his Bond was so successful? "Well, I found it hard to believe James Bond could be a spy and be so well known by barmen all over the world. My favourite was The Spy Who Loved Me and the one I would have liked to have been in, Casino Royale." He has been criticised as a lightweight actor with no significant stage career and the satirical show Spitting Image had a sketch in which his puppet was asked to show emotion and merely raised an eyebrow. But as one of the world’s top box office stars of the 70s he is hardly worried. I detected a certain surprised vulnerability in early photographs, as though he had been swept helplessly into the profession. "Well I vaguely remember, it all happened so gradually." Many think his best film and most accomplished performance was the little-known The Man Who Haunted Himself. His double role in the film drew out a deeper level of performance. "Yes I liked that film. I had a very good director, Basil Dearden," he sighs "and for once I wasn’t playing the ‘Who’s for tennis?’ hero." For the past 19 years Sir Roger’s life, has been devoted to Unicef; as a Goodwill Ambassador, raising money and visiting dark corners of the world where children need help. "It all started with Audrey Hepburn in Switzerland. She was already a Goodwill Ambassador. Unicef was looking for new people, and I wasn’t working all the time," he laughs. "I didn’t know I was being recruited." Was it "conscience" being a millionaire and coming from a modest background? "No, I’m not into paying back. I’m fortunate to be able to do something useful with my life. "Kristina and I were once in a village where life expectancy is about 30. "There was no food; they used to send children out into the scrubland to search for roots. Kristina asked one girl if she had eaten. She said she had eaten breakfast, the day before. "How can a child learn, do anything, with a rumbling belly? "Do you know more children die of starvation than through guns? Twenty years ago the mortality figures were horrifying, but by pushing countries to fulfil promises on the UN Rights of the Child, figures have almost halved." It is clear Sir Roger is passionate about his work and finds fulfilment in successes, often taking one of his own progeny with him on Unicef missions. In 1999 he was awarded a CBE and received a knighthood in 2003 for his charity work - which he said meant far more to him than if he had received it for acting. Did having prostate cancer and a pacemaker change perspectives on life? "At the time I reassessed the way things were going but then again I was born under a lucky star." What would he change? "I’d like thick wavy hair and a slim waist." And regrets? He laughs loudly: "There are things I regret like sitting in the sun too much, and having bits and pieces removed. I have told my family that when I’m buried they’ll have to go round the world collecting all the bits that have been taken off and put them all back." How would he like to be remembered? "With happiness and a drink." A View to a Kill saw Grace Jones, playing evil (but later redeemed) henchwoman May Day, jump off the Eiffel Tower to escape Roger Moore. Later in the film Bond visits the Chateau de Chantilly one of the homes of villain Max Zorin, played by Christopher Walkin. The space sets of Moonraker were constructed in three film studios in France - some of the largest film sets ever built in the country. The outside of Moonraker villain Hugo Drax's home is in fact the Château de Vaux-le-Vicomte, located just south of Paris. Sean Connery also filmed in the country. A scene in Diamonds Are Forever where Bond strangles French actress (and Miss World 1953) Denise Perrier with her own bikini top was filmed at the Eden Roc Hotel in Cap d'Antibes. French Bond women do seem to fall in with a bad crowd. Initially lined up as a Bond lover, Sophie Marceau's character Elektra King is found to be involved in a plot to blow up a submarine in Istanbul in The World is not Enough. A ski chase scene supposedly taking place in the Caucasus mountains was actually filmed in Chamonix. Similarly, French actress Eva Green played Vesper Lynd in Casino Royal who turns out to be a double agent. The tiny blonde girl who falls in love with giant metal-teethed villain Jaws in Moonraker is French actress Blanche Ravalec - who makes her living these days largely through voice-over/dubbing work in France. On the side of the goodies, Claudine Auger played Bond girl Domino in Thunderball. In the most recent Bond film, A Quantum of Solace, lead villain Dominic Greene was played by French actor Mathieu Amalric who claimed he modelled the part with "the smile of Tony Blair" and "the craziness of Sarkozy". What looks like an Afghan air base in the opening of Tomorrow Never Dies is actually the Peyragudes plateau in the Pyrenees. French free runner Sébastien Foucan is chased through a building site by Daniel Craig in the opening of Casino Royale. For several years Roger Moore has spoken out against the practices behind foie gras, which involve force feeding geese to enlarge their livers before they are cut out and eaten. Moore has written to UK MPs urging them to ban the product and more recently said he would boycott Selfridges until the store agreed to stop stocking the product. He paid for and appeared in an advert criticising the store that was placed just near to Selfridges’ Food Hall entrance. He has also lent his voice to the campaign by the People for the Ethical Treatment of Animals' (Peta) to ban the force-feeding process and has narrated a DVD which shows the way geese are treated on foie gras farms. "I have seen few things so revolting and shaming as the horrendous routine cruelty to ducks and geese that goes into the production of one of the world’s so-called culinary delicacies, foie gras," he wrote in an article in the Daily Mail. "I refuse to speak to old friends who, even when they know how it is produced, are prepared to overlook the suffering for self-gratification," he said. France produces 75% of the world’s foie gras.